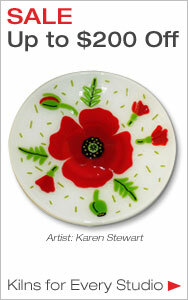 Use 1/8" shelf paper to line your kiln shelf for multiple firings and to emboss a gentle texture. 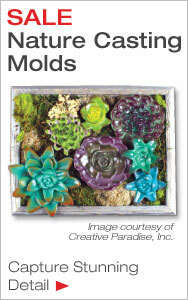 Place between glass layers to create an opening, great for making kiln formed beads and bracelets. In dimensional work cut and layer shapes for relief designs. Also referred to as Shelf Paper (Thick). Sheets measure 24" x 24" x 1/8" thick. Ornaments created by artist George Ayars. 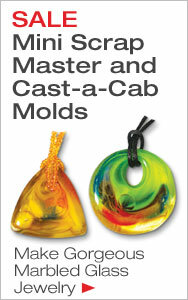 Project from "Warm Glass" book #6540. Patriotic bracelets by artist Stephanie Braman. Striped bracelet by Jayne Persico from "Kiln Formed Bracelets" book #6664. Bullseye Thinfire Shelf Paper Roll - 250' x 41"
1/4" Fiber Paper - 24" x 24"
Primo Primer Kiln Wash - 5 Lb. Bullseye Thinfire Shelf Paper Roll - 65'X 20-1/2"
Bullseye Thinfire Shelf Paper Roll - 32-3/4' x 41"
1/32" Fiber Paper - 24" x 24"
Moist Pack 24" x 24" X 1/2"
Prevent your fused glass from sticking to your mold or kiln shelf. 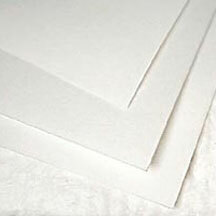 Kiln paper is made from ceramic fiber and can simply be laid on top of a kiln shelf. Shelf wash, also called kiln wash, needs to be applied to molds and shelves after every few firings. 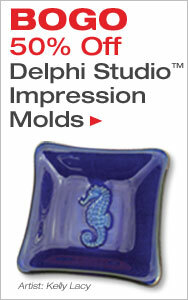 Delphi Tip: Fiber products, like fiber paper and rope, can be used for shaping, creating open spaces to your glass art and creating relief designs.